Set atop barren cliffs, during calm weather the great white domes and dishes of GCHQ Bude sit in silence broken only by seabirds. But high perimeter fences isolate the satellite ground station from curious coastal walkers; scouring nearby footpaths, security cameras monitor and record. For while the site’s visible from miles away, it’s also Cornwall’s most secret place. Since 1919 Britain’s had a code-breaking agency, to analyse information gathered from foreign powers. That year the Government Code and Cypher School was founded, based in central London and run by the Foreign Office. The term Government Communications Headquarters first appeared as a cover name for a new centre created in 1939, away from the capital at Bletchley Park in Buckinghamshire. Each day during the Second World War Bletchley’s code-breakers were fed with encrypted enemy radio transmissions, intercepted by a network of stations across Britain. When the team moved to Cheltenham in Gloucestershire during the early 1950s the GCHQ title was formally adopted. Today Bletchley Park’s wartime successes are celebrated, especially the astonishing mathematical feats led by brilliant Alan Turing in decrypting the German Enigma cipher machines. By contrast, GCHQ’s post-war activities have always remained elusive to the public eye. Secrecy is vital in its work at the heart of Britain's international confrontations, her struggle against terrorism and the prevention of serious crime. One of the country’s three security services alongside MI5 and MI6, GCHQ deals with signals intelligence, known as SIGINT: the eavesdropping, interception and analysis of radio and electronic signals to draw together information. Once studied and filtered, data of possible importance is passed to the Government’s military, diplomatic and law enforcement departments, and often to Britain’s allies. The service also uses its Information Assurance processes to protect Government communication and data systems from cyber-attack. In 1967, to increase its international listening capacity GCHQ began work on a new satellite ground station, situated in north Cornwall. That year the Ministry of Public Buildings and Works was allotted land on which to build, a flat, remote clifftop area at Lower Sharpnose Point, around 5 miles north of Bude. Throughout the war against Nazi Germany, the site had hosted an RAF station used for anti-aircraft practice. Named Cleave after a local farm, the trainee gunners fired out to sea at target-tug aircraft and radio-controlled aerial drones. But though the base closed in 1945, the vacated land remained in government ownership. Early into the project, GCHQ engineers visited the civilian satellite communications terminal located around 80 miles south-west of Bude at Goonhilly, on the Lizard. There they examined Goonhilly’s methods of bulk information handling, particularly its telephone traffic. Meanwhile in 1969 construction of the Bude station began, remaining wartime buildings mostly swept away. The location was ideal; clear air free of electrical interference, and solid bedrock to support huge dish antennas. Its remoteness too was attractive, inaccessible and difficult to find among obscure back roads. Transporting materials and large pieces of equipment through the winding lanes was a logistical horror, but by 1974 CSO (Composite Signals Organisation) Morwenstow was operational. The site was equipped with the most sophisticated receiver technology available, including two truly enormous dishes weighing hundreds of tons, to capture signals broadcast from across much of the world. Between Morwenstow and a base run by its American counterpart, the National Security Agency, by the 1980s global interception was achievable of transmissions across the INMARSAT land, sea and air mobile satellite communications system. But as the various satellite networks grew and their broadcast rates soared, so the listeners’ equipment and capacity had repeatedly to be upgraded. To preserve a truly global intercept capability, international co-operation became essential; more bases were built around the world by the allied powers. At Morwenstow a third giant dish appeared, and during July 2001 the site became known as GCHQ Bude. 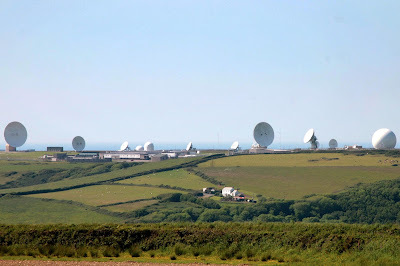 For some time, it’s thought, Bude’s activities were assisted by nearby Goonhilly. Perhaps it was no coincidence that the eavesdroppers’ base had been built close by; countless signals from satellites received by the civilian terminal were duly captured by GCHQ. 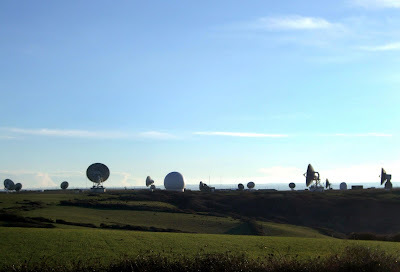 But by the time Goonhilly ceased most of its operations in 2008, Bude had long established a stand-alone capability; the various antennas, around 20 altogether, could track most signals passing through western communications satellites. Allegedly the station can cover all the main electromagnetic frequency bands: L-band, C-band, Ku-band, X-band, Ka-band and V-band. This would allow interception across a huge spectrum, from computer data to TV signals live and recorded, fax and telex, internet, telephone landlines and cellphones. Commentators believe Bude’s antennas are often angled toward the INTELSAT satellites, as well as those of its former Eastern Bloc INTERSPUTNIK equivalent, and the INMARSAT system. The satellites are positioned over mainland Europe as far as the Urals, the Atlantic and Indian Oceans, Africa, and the Middle East. Between them, they deliver voice and data communications for the world’s leading media and telecoms companies, multinational corporations, internet service providers and government agencies. 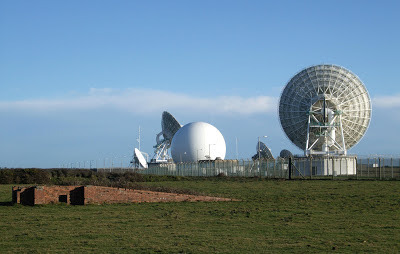 Bude also contributes to the mysterious commercial and private communications intercept system named Echelon, established world-wide between GCHQ and the National Security Agency. Echelon’s suspected existence first emerged in a 1997 European Parliament report and though its presence is no longer in doubt, for some time neither Britain nor the United States went out of their way to add any details. With their overseas partners, each day GCHQ’s listeners screen millions of captured messages for key words, using voice profile libraries and dictionary computers. Most are discarded, but those using suspicious words or the names of prominent people attract analysis. During the 1990s some EU states expressed concerns over Echelon’s more commercially-sensitive intercepts and the fear that with others, Bude might be involved in industrial espionage. In July 2001 a second European Parliament report appeared, intended to provide reassurance by giving a degree of information about Echelon. Without revealing activities in any detail, impossible given the network’s covert role, the report emphasised its security and intelligence purposes; misuse of commercial information was denied. Also touched on was Echelon’s limited technical suitability for industrial espionage. By that time, most EU member states had established parliamentary committees to scrutinise their intelligence services. In Britain the job fell to the Intelligence and Security Committee, which monitors GCHQ’s activities as well as those of MI5 and MI6. Recently though it’s been suggested GCHQ has circumvented the law in other ways, intercepting personal data on British citizens through the US Prism spy programme. Prism is said to give systems access to nine of the world's top internet companies including Microsoft, Skype, Google and Facebook. The British government has faced pressure to answer allegations that using Prism has allowed GCHQ to evade the UK legal process for obtaining personal material such as emails, photographs and videos. The government denies CGHQ has acted illegally. Meanwhile, beyond Bude's security fencing there’s still some evidence of the RAF's wartime presence: at the cliff edge, concrete plinths that once mounted artillery and the target-aircraft catapult; the old mobile radar ramp; pillboxes dotted around. Passing cliff-path walkers are able to inspect the relics, but today’s base wouldn’t take at all kindly to close examination. The activities of GCHQ Bude remain as opaque as the sudden sea mists which roll in along the Cornish coast, but one thing’s for sure: they’ve got your number. Writer and editor. Enjoys thrashing previously musical instruments. Beast of Bodmin: Truth Or Fiction? Wimbledon's First Hero: Dustin Brown!